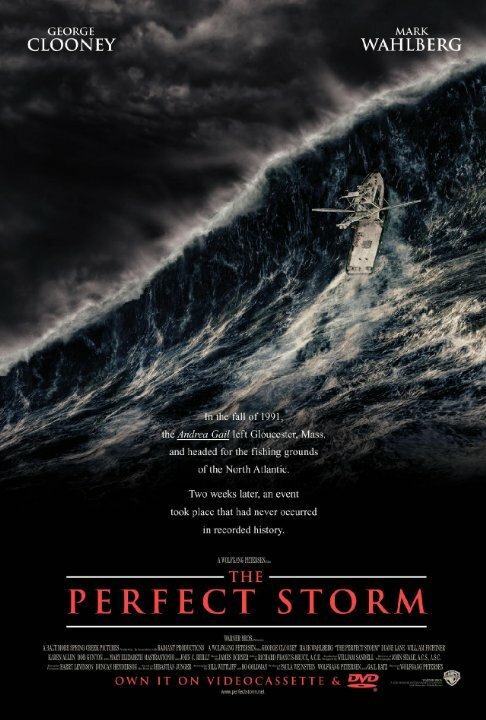 The Perfect Storm is based on a real life event where two storms of immense proportions clashed and a boat was destroyed along with its crew. I don’t remember hearing about this event before so I suppose that it was before my time. (After all, I hear about all the big news….sorta) There are a few big sideplots to try and pad out the time, but I’m afraid that they certainly don’t contribute anything to the narrative. One of the subplots is about a little boat that also got caught in the storm. The Captain reminded his passengers that he’s never needed a map before and he doesn’t need one now. As a result, they’re tossed around in the waves for a while. I like the Captain’s gusto, although he is endangering everyone else just to prove his gusto. That’s certainly not the wisest course of action and he’s pretty much just there for comedy. He was a well done character though so I’ll give him some props there. Another subplot is that the Captain of the main ship is warned by the Captain of another one that he is in a dangerous zone. He barely listens to her though and while she almost saves him in time by calling in a chopper, it was too late. Naturally, the main plot is where the meat of the story is, but unfortunately the characters do drag it down. The beginning is pretty sad and reminded me of Cloverfield to an extent. Especially considering that these guys are based on real individuals, you’d think that they would try to make the characters look better. One guy’s a flirt who only really cares about one night stands and never develops into a likable person. Another one doesn’t listen to his wife’s warnings about going to see and decides that the adventure is worth the money. The Captain yells at his crew quite a bit to remind them who’s in charge and to stop any betrayals before they can occur. Without any likable characters, any film would have an issue being good. The characters constantly getting into fights with each other just makes you wait for the inevitable storm so that something can advance the plot. I also think that the film put too much emphasis on random fish scenes to pad out the time. We saw so many fish get chopped up that I was starting to feel in the mood for a good Salmon. We don’t need excessive animal violence in any film. The excuse of fishing being a sport just won’t cut it here. We don’t need that to be featured in the movie. I’d also argue that the situation made the characters look a little bad, but naturally there may have been different circumstances in the real life event. The characters have to choose between their fish going bad and heading into the super storm that’s directly in front of them. Their boat’s good, but it’s not exactly military grade so the mission is effectively suicide as soon as it is mentioned. If you ask me, they should just let the fish spoil. A really inconvenient moment was definitely the fact that the characters ran out of ice, which meant that they couldn’t get any more fish. Returning home empty handed would have been humiliating and some of them would have probably been fired, but at least they’d be alive. It’s a tough personal choice to make, but when you have friends and family back home waiting for you, it’s time to make the tough calls. If anything, it’s very impressive to see the military get involved and ride into the storm. I’m sure that it was the last thing any of them wanted to do since it was a dangerous situation. They’re probably wondering why everyone was out in the middle of the storm when it had been predicted for a while, but that’s how it goes. I feel like they could have been able to refuel in the film. They kept missing the shot, but why not try and try again until you literally can’t? I didn’t agree with the decision to just give up. Overall, The Perfect Storm could have been a much better adaption. Based on the Wikipedia section of possible errors, it could have been more accurate as well. Although I’m sure that people would have been tackling them with denials and such no matter what so I can’t really comment on the accuracy. A lot of the padding could have been removed and the characters should have looked a lot better. Just as it’s said “Don’t speak ill of the dead” they should be portrayed as fairly good characters. They don’t have to be perfect, but I doubt the families would be thrilled about how some of these guys looked. Well, getting caught in a double storm would certainly be dicey so I advise you to stay ashore and if you have to choose between fish and your life…I trust that you’ll really think about the options before making a move. I don’t believe in going outside to find adventure or anything like that so when the next storm hits, I’ll be in bed with a chocolate chip cookie playing a nice round of Super Smash Bros. This entry was posted in Live Action Movies and tagged Action, Based on a True Story, Biography, Film, Movie, The Perfect Storm, Thriller by dreager1. Bookmark the permalink.